important attractions. 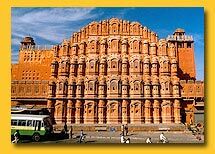 Known as the Pink City because of the colour of the stone used exclusively in the walled city, Jaipur's bazaars sell embroidered leather shoes, blue pottery, tie and dye scarves and other exotic wares. Western Rajasthan itself forms a convenient circuit, in the heart of the Thar desert which has shaped its history, lifestyles and architecture. been a part of the state’s architectural heritage, now it became much more opulent. The private wings of the family also extended their entertainment areas. Since defence was no longer a primary concern, larger, more ornamental windows were built to over look the streets or courtyards outside these wings. Gardens were no longer planned within the internal courtyards only, but were added to the external vistas, and water, a basic feature of Mughal palaces and gardens, was utilised in a similar fashion, in canals and fountains. : Jaipur is connected by rail with Delhi, Agra, Ahmedabad, Ajmer, Abu Road (Mount Abu), Udaipur, Bombay and Sawai Madhopur. Rajdhani Exp. 2958 0045 1005 Ex. Wed.
Shatabdi 2016 1745 2211 Ex. Wed.
Rajdhani Exp. 2957 0230 0750 Ex. Tue. 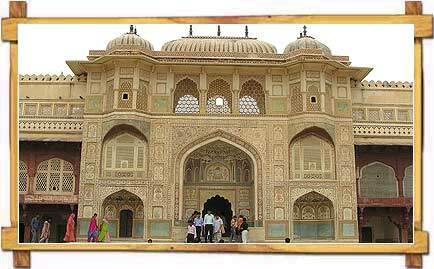 : Regular buses ply from Jaipur to the above places and Alwar, Kota, Sariska, Mathura, Indore, Chittorgarh and Barmer. 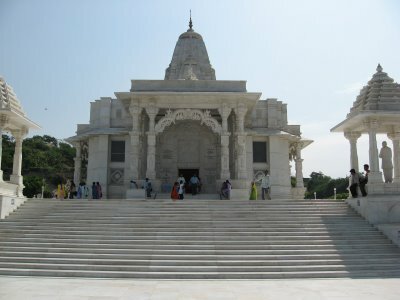 : Indian Airlines connect Jaipur with Delhi, Jodhpur, Udaipur, Aurangabad, Bombay, Varanasi, Calcutta, Ahmedabad.